Guy Fieri heats up Food Network's Primetime lineup with the season two premiere of Guy's Grocery Games on Sunday, May 11th at 8pm, as four talented chefs compete in cooking challenges inspired by obstacles that home shoppers face in the supermarket aisles every day. Then, the battle between the most talented home cooks comes to an end when one contestant from one region will be crowned America's Best Cook on Sunday, May 18th at 9pm. Rounding out May are premiere episodes of Chopped, Food Court Wars and Save My Bakery, along with new episodes of Farmhouse Rules, The Kitchen and Southern at Heart. FoodNetwork.com makes springtime entertaining a breeze with recipes, tips and guides for every occasion. Join the Food Network conversation on Facebook and Twitter. Four talented chefs compete in supermarket-themed cooking challenges as they must navigate their way through the aisles, adhering to "real-world" obstacles doled out by host Guy Fieri. Whether it is shopping on a budget, substituting out-of-stock ingredients or grabbing groceries at closing time, the contenders have to shop, prepare, and plate three different dishes using whatever they can pull off the shelves. Ultimately, the food does the talking, as one-by-one the losing chefs "check out," with the last chef standing going on a shopping spree of a lifetime worth up to $20,000! Premiering Sunday, May 11th at 8pm - "Moms Knows Best"
It is the mother of all shows, when four devoted moms and talented chefs battle in a game where they can only cook with ingredients that start with the same letter. In the second game, the moms must make brunch for four on a budget. The two remaining chefs are thrown for a loop when preparing a guilty pleasure. Premiering Sunday, May 18th at 8pm - "Caught in the Middle"
Four chefs must make an international dish using only ingredients in The Middle aisles of the store. Next, the chefs must create their best seafood dish with five ingredients or less. Finally, there are twists around every Turn as the two remaining chefs make their signature hamburger, but the grocery store might be Out of Stock of their preferred ingredients! The prevailing chef could win up to $20,000. Premiering Sunday, May 25th at 8pm - "Grocery Grillin'"
Things heat up in this grilling episode when four chefs must use peanut butter in their grilled pizzas. Next, the chefs must dig through Guy's Clearance Carts filled with mystery meats, unmarked cans and more to cook up the best dish possible. In the final game, the best chef will come out on top in the game Top Shelf/Bottom Shelf. Premiering Sunday, May 4th at 9pm - "Mentor Meltdown"
Six home cooks remain in the competition and must compete to create a brunch dish. They face one of their most intimidating judges yet - Iron Chef Geoffrey Zakarian. After consulting with their mentors on their dishes, the cooks are thrown a twist - they must make a signature cocktail that would put a mimosa to shame. After Chef Zakarian's deliberation, the bottom four cooks and their mentors move on to the Pressure Cooker round where they must transform eggs into a dinner entrée. At the end of the round, another mentor loses a team member and is one step closer to elimination. Premiering Sunday, May 11th at 9pm- "Seven Deadly Dishes"
The five remaining cooks remaining are just one week away from the finale. They are challenged to cook with intimidating ingredients that would stump even professional chefs. Each cook is randomly assigned either Arborio rice, scallops, quail, octopus or chicken livers to cook with. The mentors guide their cooks to help them avoid pitfalls with their dreaded ingredient. Guest judge Chef Marcel Vigneron determines who faces elimination. For the Pressure Cooker round the bottom four cooks must fillet and portion out a piece of salmon and then create a fish entrée with sides. 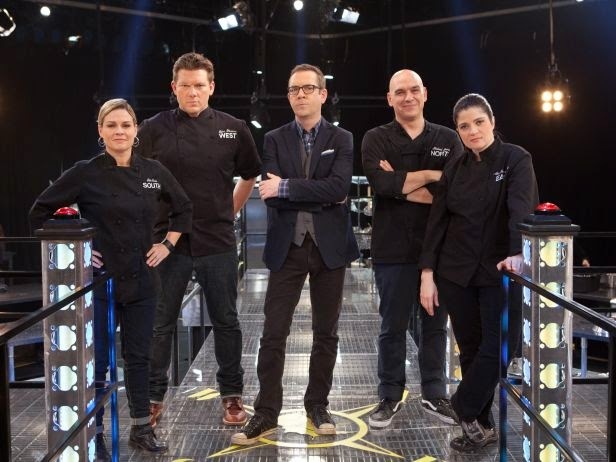 Premiering Sunday, May 18th at 9pm - "Thunderdome Finale"
The final four cooks enter the finale with their chef mentors. They must not only compete in three challenges but wow guest judge Bobby Flay if they want to be named America's Best Cook and win the $50,000 grand prize. The finale features three single elimination rounds leaving two cooks to battle it out in the third and final challenge. The cooks are given the green light to prepare whatever dish they want, to prove they are America's Best Cook! Online, find original videos featuring host Ted Allen and mentors Cat Cora, Tyler Florence, Alex Guarnaschelli, and Michael Symon, along with exclusive previews and episode highlights. Join the competition at home with regional recipes and challenge to choose the most popular dish. Join the conversation on Twitter using #BestCook. Premiering Tuesday, May 6th at 10pm - "Mother's Day"
In this episode, four moms battle it out for the title of Chopped Champion! Mothers who usually rule their home kitchens attempt to stay composed as they cook in a much larger arena. In the first round, the moms are given chicken noodle soup and salsa, along with other mystery ingredients for their appetizers. Then in the entrée round, the moms must contend with a sugary ingredient that kids tend to love, but parents often ban from breakfast. The final two moms find lady fingers in the mystery basket that they must work into their desserts. Premiering Tuesday, May 13th at 10pm - "An Egg Up"
The chefs battle it out for the lead in the first round as they try to figure out what to do with potent, infamous one- hundred-year-old eggs! In the entrée round, mango pudding must make its way into the competitor's main dishes. In the final round, with waffle cones in the mystery basket, will either one of the last two chefs decide to make ice cream for dessert? Premiering Tuesday, May 20th at 10pm - "G'day, Chefs!" The competitors find that in every round, there is a taste of Australia in every basket! Will the competitors think this theme makes for a g'day in the kitchen? In the first round, lamb ribs are the Down Under favorite that the chefs must make their own, and a very alcoholic beverage leads some chefs down a dangerously fiery path. In the entree round, emu fan fillets shock the contestants, and later the judges are on the edge of their seats wondering if a mistake in the dessert round can be corrected in time. Premiering Tuesday, May 27th at 10pm - "Cool, Palm and Perfected"
The chefs find blowfish tail in the first basket and hope they can keep their cool as they cook up an amazing appetizer in a hurry. Then in the entrée round, the competitors find a can of something orange and a jar of something rather unusual: date palm in brine. When the two finalists take on dessert, aiming for perfect final dishes, they find out they must incorporate basil juice. Do not miss Chopped After Hours, a web series on FoodNetwork.com, where the Chopped judges step out from behind the chopping block to put their own spin on some of Chopped's toughest and strangest baskets. Premiering Thursday, May 1st at 9pm -"The Young and the Timeless"
Chefs stumble over simple ingredients when cheese puffs and chicken legs make an early appearance. In the entrée round, the canned version of an elegant seafood confounds the contestants, but ultimately, the struggle to transform corn dogs and prosciutto into a delectable dessert will decide who will become Chopped Canada Champion. Premiering Thursday, May 8th at 9pm -"When Life Hands You Lemonade"
A sickeningly sweet canned good presents a challenge in the appetizer round, as one young buck faces off against three seasoned chefs. Colorful candies and burdock root complicate the entree basket. In the dessert round, the last remaining chefs fight to keep their dreams from being squashed. Premiering Thursday, May 15th at 9pm -"Snakes and Batters"
One chef gets skewered by candy rolls and beef loin in the appetizer round. Things heat up in The Kitchen when one chef gets a leg up in the dinner round, then the dessert round presents a hot date with destiny for the remaining two chefs. Premiering Thursday, May 22nd at 9pm -"The Spruce is Loose"
One chef finds himself in hot water when mussels and mushrooms appear in the appetizer round. A beverage from the space age makes for a sweet surprise in the dinner round. The chefs spruce things up in the dessert round with plantains and palm sugar. Premiering Thursday, May 29th at 9pm -"Pressed for Ham"
The chefs are hard pressed to impress in the appetizer round when they are forced to combine canned ham and kohlrabi. Three remaining chefs give us something to "root" for when they combine bacon and bok choy. Ultimately, one chef will "beet" out a victory with pound cake, candy and marjoram. Premiering Sunday, May 4th at 10pm -"Ladel-ayheehoo"
Serving ladles become one chef's cooking vessels to cook French Onion Soup in Round One, while another chef must build a stick of butter from mini-packets by hand. The Cutthroat Kitchen Wheel of Heat makes its debut for a Blackened Fish challenge, and lastly, Alton Brown forces one chef to make ice cream in a kids' toy, and a contestant's bananas are pulverized to a pulp for their banana split. Premiering Sunday, May 11th at 10pm -"Life's a Mystery ... Meat"
The term mystery meat is given new meaning for three chefs while making Sloppy Joes and another contestant must get acquainted with aluminum foil and plastic wrap. Alton Brown's leftover chicken coop wire becomes a big headache for one competitor during a chicken piccata challenge, and finally, it is game time when the carnival comes to town and the contestants must play a classic game to win the final round. Premiering Sunday, May 18th at 10pm -"Hakuna Frittata"
First up, making a frittata becomes nearly impossible as one chef must cook inside eggshells while another must navigate their way through a carton of crushed eggs. Next, Alton Brown makes a yard sale box of old kitchen supplies one chef's worst nightmare during a po' boy challenge. Finally, one chef earns the right to shred their opponent's Steak Diane and another must devise a way to use Cognac candy. Premiering Sunday, May 25th at 10pm -"Well, Hot Clam!" First up, the ultimate backyard grill suit is unveiled and one chef must use a snow cone grinder to grind up their protein. Then, one chef's equipment becomes all tangled up in fish nets during a clam bake challenge. In the final round, Alton Brown makes claw hands the name of the game for a BBQ chicken sandwich while one contestant must use only turducken. Premiering Friday, May 2nd at 10pm - "Real Deal Mexican"
Some of the tastiest stops on host Guy Fieri's road trip have been at Mexican joints, where generations-old family recipes and totally fresh ingredients combine to create incredible food. Coast to coast, from Chicago to Salt Lake City to San Diego, new twists on old classics are keeping tradition alive. From the chicken stuffed sopapilla at Salsa Brava to the pozole at La Texanita and the outta bounds smoked trout at Momocho, this one-hour special is stuffed to the brim with south of the border stunners. Premiering Friday, May 9th at 10pm - "Cross Country Comfort Food"
Guy has got the goods on stick-to-your-ribs knockouts from the ski slopes to the sea. In Miami, Fla., a law student who switched out his suit for a chef coat is dishes up comfort food like spicy oxtail and ragu. In Park City, Utah, a local boy serves up low-brow gourmet grub like the signature chivito club, and a mom and pop ski lodge keeps the snow bunnies fed on flavorful favorites like pork osso buco. Premiering Friday, May 16th at 10pm - "International Family Style"
Guy takes his place at the family table visiting a sibling-run Vietnamese joint serves up mom's legendary recipes for authentic dishes like pho and bahn mi in Holladay, Utah. In Kailua, Hawaii, brothers dedicate their lives to fulfilling dad's lifelong dream of having his own restaurant, and crank out island favorites like Hawaiian-style kalbi ribs and mochiko chicken. In Salt Lake City, Guy visits a Greek joint drawing inspiration from the family playbook and sourcing fresh ingredients straight from Greece for dishes like grilled octopus and righteous lamb tacos. Premiering Friday, May 23rd at 10pm - "Island Flavor"
Guy is cruising through Hawaii for an authentic taste of Oahu. In Waipahu, a family-run Filipino joint serves up scratch-made favorites straight from mama's cookbook and in Aiea, a double-duty bowling alley/restaurant is keeping it funky with a best-ever oxtail soup. On the windward side of the island, in Kaneohe, Guy discovers the tiny authentic Hawaiian drive-in where a world-class chef cooks up fresh fish like pan-fried ono and signature ahi cakes. Premiering Friday, May 30th at 10pm - "Grillin, Chillin & Huli Huli Chicken"
This trip, Guy discovers unique grills on the mainland and beyond. In Miami, Fla., a husband/wife duo serves up classic Americana with a 21st century twist like smoky fried chicken and Buffalo-style pig wings. In Long Beach, Calif., an anything-but-average taco truck grills steaks for their drunken torta and deep-fries green chicken chilaquiles, and in Oahu, Guy's favorite rotisserie chicken joint cranks out the island's signature huli huli chicken. Premiering Sunday, May 4th at 8pm - "Sabor de San Miguel vs. Ramen Bar"
Brother and sister Juliano and Noris dream of using their Guatemalan recipes to continue their family legacy and hope to open their own restaurant. Best friends Holly and David hope their concept of a Ramen Bar will allow them to follow their dreams of owning a restaurant, as Holly quit her job and David lost out on a deal to open his own restaurant a few years ago. Only one team can win a spot in the local mall in Newark, Calif.
Premiering Thursday, May 15th at 10pm - "Ophelia's vs. Ms. Ney's Gourmet"
Renee and her daughter Tara are home cooks who hope their upscale salad restaurant, Ms. Ney's Gourmet, will allow them to follow their passions and help them start their new lives. Best friends Malcom and Cordey want their soul food concept to honor the strong women in their lives. With the guidance of Tyler Florence, the teams battle at the Colin Creek mall in Plano, Texas, for the chance to win a spot in the food court. Premiering Thursday, May 22nd at 10pm - "J's Kitchen vs. Kadook's"
Hosted by Tyler Florence, it is Filipino vs. Costa Rican cuisine as two teams battle for the chance to win a food court restaurant in Sierra Vista, Ariz. Friends Joyce and Lisa hope a successful Filipino restaurant will help Joyce bring her family together in the U.S., while husband and wife Ray and Kristine got engaged in Costa Rica and hope to prove to their son the value of following your dreams. Premiering Thursday, May 29th at 10pm - "Mark's Gourmet Dogs vs. Grand Grillin'"
In Lansing, Mich., one food truck will be turning into a food court restaurant. Married couple Mark and Krysta has put every penny into their struggling gourmet hot dog cart, and strive to provide a more secure life for their son. Co-workers Vicki and Kathy hope for financial stability for their grilled chicken cart: Vicki is eager to give herself a paycheck and Kathy looks to have a larger role in the business. Premiering Sunday, May 25th at 9pm - "Grill Masters: U.S.A. vs. Australia"
Team USA (Iron Chefs Bobby Flay, Marc Forgione and Alex Guarnaschelli) battles Team Australia (Chefs Adrian Richardson, Darren Robertson and Tobie Puttock) in a Grill Masters competition. Hosted by Alton Brown, judges Donatella Arpaia, Ryan Kwanten and Elizabeth Karmel determine who reigns supreme in Kitchen Stadium. Hosted by Bill Rancic, Kitchen Casino ups the ante of cooking competitions, bringing together four talented chefs in a high-stakes game of chance that is all about skill, SPEED and adaptability. With one eye on the ticking clock, competitors have to out-cook and out-smart their competition in three casino-themed challenges -- slots, poker and roulette -- for a chance to win a $30,000 Jackpot. Top chefs working at the top of their game should be able to make magic with whatever Lady Luck puts in front of them; these competitors will have double-down on their skills or risk being 86'd. Place your bets! Premiering Monday, May 5th at 10pm - "Bad Poets Society"
Danny and Jonathan, owners of Old School Bar and Grill in Austin, Texas, are concerned about a loss of revenue on their "Poetry Nights." Charles sends in Mystery Diners Justin and Samantha to find out why the register is being affected. Premiering Monday, May 12th at 10pm -"Family Ties"
Carl, owner of Bakehouse Restaurant and Bar in Austin, fears a dispute between his son and favorite waitress is threatening the harmony of his restaurant. Charles sends in Mystery Diners Holly and Samantha to decide which employee must leave the restaurant. Premiering Monday, May 19th at 10pm -"Fraternal Disorder"
After hearing rumors that kegs of his privately brewed beer are showing up at local frat parties, Rick, owner of Uncle Billy's Brew and Que in Austin contacts Charles for help. Mystery Diners Vanessa and Robin go undercover to see how easy it is to purchase a keg. Premiering Wednesday, May 7th at 10pm - "Meet the Impossible"
Robert Irvine and his team have traveled to more than 100 locations to help America's failing restaurants. Now, hear the never-before-told stories behind the show and meet the folks that make this impossible series possible. Featuring an interview with Robert and Executive Producer Marc Summers; a first ever sit-down between Robert, his construction manager and all three designers; a look back at the dirtiest kitchens, most stubborn owners and most dramatic reveals and more! Premiering Wednesday, May 21st at 10pm - "Living in the Dark Ages"
Robert Irvine tackles his first-ever theme restaurant, when he comes to the aid of Buzz, the owner of Cave Inn BBQ, a new dinosaur-themed restaurant. Robert and his team will need to completely overhaul the "decor," which consists of a few inflatable dinosaurs and foam rocks glued to the wall, as well as the kitchen, which is sent into chaos by Buzz's brother, who puts more energy into his Hollywood dreams than this Winter Garden, Fla., eatery. Premiering Wednesday, May 28th at 10pm - "The Writing on the Wall"
Daniel is the owner and operator of a successful sawmill, and thought he would be able to run Big Jim's Bama Q in Hammondville, Ala., when he purchased it ten months ago, but his inexperience and naïvety has left him seeking Robert Irvine's help. Robert needs to find a way to make this restaurant distinctly Daniel's, and that means new food, a new look and new knowledge and passion to Turn this dump into a barbecue destination. Iconic snack foods are transformed in Rewrapped, a new competition series hosted by Joey Fatone. From Twinkies to Goldfish to SpaghettiOs, three competitors use their talents to recreate and innovate America's most beloved snacks. First, the challengers attempt to duplicate the original item from scratch. Then it's onto the second round, where they must use the snack food in a completely original dish. Led by head judge Marc Summers and a panel of expert judges, only one can be crowned the Rewrapped champ! Premiering Wednesday, May 7th at 8pm -"Baking Excuses"
Ann's Bakery is the oldest and most famous cake shop in Tulsa, Okla., but it has been downhill for the shop since a fire ravaged The Kitchen and forced the bakery to close for over a year. In the face of slashed cake sales and debt, owner Sharon has handed the reins to her daughter Shannon, who has struggled to keep up with her workload and keep staff happy. Kerry Vincent needs to bring this 75-year-old institution out of the past and into the future with fresh cake ideas and a renovation of epic proportions. Premiering Wednesday, May 14th at 8pm -"Confection Disconnection"
Lori's Sweet Sinsations Tea Room and Bakery in Sapulpa, Okla. is the dream of stay-at-home mom Lori, who has put her savings on-the-line just to keep the place alive. Lori's heart is in baking, but her business skills are lacking; she cannot manage staff and she will often give out product for free! Kerry knows that this is not a recipe for success, so she gives Lori and her husband, Bobby, a crash course in pricing, staff training and amping up the flavor of this home baker's creations. Premiering Wednesday, May 21st at 8pm - "Cakes Will Roll"
Premiering Saturday, May 3rd at 10:30am -"Poker Night with Aunt Jean"
Nancy's Aunt Jean in is town from Las Vegas. Nancy organizes a poker night with a Southwestern flair fit for a Queen, or an Ace! Nancy whips up several finger food dishes perfect for a night of cards -- Chorizo Quesadillas with Easy Homemade Salsa, Buffalo Shrimp Skewers and Nancy's Pomegranate Guacamole. Nancy also has a special treat in mind - a Sparkling Vodka Margarita made with apple vodka from the orchard right down the road. Premiering Saturday, May 10th at 10:30am -"Early Birds"
Nancy is having three special mothers over for a scrumptious breakfast. On the menu is Buttermilk Pancakes with Blueberry Syrup, Sausage, Spinach, and Potato Breakfast Tart, Citrus Salad with Pistachios & Honey Vinaigrette and Bloody Marias with Bacon Wrapped Cornichons. Before her guests arrive, Nancy heads to The Farm at Miller's Crossing - a local Maple Tree farm that makes the most delicious fresh maple syrup. Nothing but the best for the moms! Premiering Saturday, May 17th at 10:30am -"LOL (Lots of Leftovers)"
David is out of the house for a golf tournament and Nancy has the day to herself. With a busy day tending to her container garden and finishing chores around the house, Nancy uses leftovers to make a delicious meal for David when he gets home. On the menu is a Fried Chicken BLT Melt, Tomato Vegetable Rice Soup and Cheesecake Balls. Premiering Saturday, May 24th at 10:30am -"Operation: Farm Fresh"
Nancy hosts a "Welcome Home" party for her nephew and his service buddies who have just gotten back from performing combat rescue operations in Afghanistan. They are hungry for an All-American home-cooked meal, and Nancy is happy to oblige. On the menu is Fried Pork Chops, Braised Kale and Tomatoes, Apple Pie with Cheddar Cheese Crust and Beer Ginger Shandy. Premiering Saturday, May 31st at 10:30am -"Grill Marks the Spot"
Nancy and David are having Nita and the kids over for a cookout! What's better than Nancy's beautiful Grilled S&P Crusted Ribeye and Garlicky Green Salad? Grilled Banana Boats, that's what! Nancy heads to town to find some delicious chocolate candies to stuff in this fun dessert. After the cookout, the family enjoys Creamy Orange Soda Floats as they set the twilight sky alight with flying lanterns. Premiering Sunday, May 4th at 10:30am -"Spice of Life"
Giada De Laurentiis turns up the heat in The Kitchen as she creates hot and fiery recipes from around the globe like Vietnamese Red Snapper with Noodles, Vegetable Paella, Spiced Beef Kabobs with Cucumber Yogurt Sauce and Moroccan Chocolate Mousse. Premiering Sunday, May 11th at 10:30am -"Lunch with Mom"
Giada prepares a special Mother's Day lunch for her sister and their kids. The festive menu includes Strawberry Tomato Jam Crostini, Prosciutto and Cucumber Crostini with Arugula Mustard and Fusilli with Sundried Tomato Vinaigrette. Premiering Sunday, May 18th at 10:30am -"Mini Me"
Giada De Laurentiis creates a fun small-bite party menu that features mini versions of some of her favorite recipes over the years. On the menu are Mini Antipasto Calzones, Roasted Fingerling Potatoes with Lemon Parsley Aioli, Ricotta and Cinnamon Meatballs and Chocolate Honey Almond Tartlets. Premiering Sunday, May 4th at 11:30am -"Comfort with a Kick"
Guy Fieri is taking American comfort food and mixing in a little Mexican flavor, starting off with his Mexicana Meatloaf, filled with mild peppers, black beans and corn, served with Cilantro Pesto. On the side, Guy serves up Spicy Polenta Cakes topped with honey and lime and to cut the heat, a cool, refreshing Hibiscus Margarita. Premiering Sunday, May 11th at 11:30am -"Flowers for Mom"
This Mother's Day, Guy Fieri knows no ordinary steak will impress his mom, Penny. He needs a steak that will really wow her; so he prepares his special Cauliflower Steaks, served with a Kalamata Olive and Red Pepper Tapenade. Guy dishes up Prosciutto-Wrapped Scallops, served with a buttery white wine sauce, and for dessert, Champagne Cantaloupe Granita. The whole menu is easy, elegant, and sure to impress! Premiering Sunday, May 18th at 11:30am -"Spicy Bar Snacks"
Guy Fieri loves bar snacks for their addictive flavor, so he is sharing a couple of his favorite off-the-hook recipes. First up, Guy shares his Lollipopped Spicy Asian Chicken Wings, followed by Spicy Jalapeno Artichoke Dip, with Swiss chard, tons of cheese, bacon and more. What are bar snacks without the bar? Guy's Peated Lemons Cocktail is a smoky, citrusy, and herbal drink pairs perfectly with zesty snacks. Premiering Sunday, May 25th at 11:30am -"Italian Our Way"
Guy Fieri and celebrated chef Jonathan Waxman are together again, sharing industry stories, cooking tips and delicious recipes. They prepare effortless but impressive recipes including Guy's Spicy Clams with White Wine and Italian Sausage Pasta, and Chef Waxman's California Caponata. With such simple, delicious recipes, the two even have time to whip up a loaf of crusty Sourdough Garlic Bread! Spend a fun and food-filled morning in The Kitchen with hosts Sunny Anderson, Katie Lee, Jeff Mauro, Marcela Valladolid and Geoffrey Zakarian. These five talented food experts will bring fun conversation and delicious recipes into your kitchen every week. From simple supper ideas to the latest food trends, they will cover all things fun in food. Pull up a stool at the counter and join them in The Kitchen. Everybody knows every great party ends up in The Kitchen! Online, check out exciting updates, including recipes from the show, behind-the-scenes photos and fun facts from the culinary department. On the FN Dish blog, get one post each week written by one of the hosts, plus special giveaways. Premiering Saturday, May 10th at 10:00am -"Cooking for Edina Mae"
Ree is stocking up the freezer for Ladd's grandmother, Edna Mae. On the drive from the ranch to town, she is sharing the mouthwatering dishes that she has packed up, the perfect food to have on-hand, plus tips and tricks for preparing the moveable feast; including recipes for Waffles, Lasagna Roll Ups, Potato Soup and Cheese Toast. Premiering Saturday, May 17th at 10:00am -"Calf Working"
Ree is doing some cowgirl catering as she pitches in with the cowboys working the calves and taking them a delicious breakfast of Apple Fritters, then serving up a fabulous lunch of Pulled Pork, Twice Baked Tater Slices and Iceberg Chuck Salad with Spicy Ranch Dressing to the hungry crew down at the pens. Premiering Saturday, May 24th at 10:00am -"Tools"
Ree tours a local kitchen store gathering some favorite tools for a wedding gift. As she gathers the goodies, she shares the great dishes she will prepare with these tools, including Italian Meatball Soup, Potato-Leek Pizza, Skillet Cookie Sunday and Orange Brulee. Premiering Saturday, May 31th at 10:00am -"Burning"
It is fires on the ranch and flames in The Kitchen as Ree grills up a rib-sticking dinner for the family after an afternoon burning grass on the prairie. They enjoy a Grilled Chicken Sandwich Bar, Grilled Potato Bundles, Grilled Corn and Bell Pepper Butter and Dutch Oven Blackberry Cobbler. Premiering Sunday, May 4th at 8am -"Roll it on Over"
Rachael Ray shares two versatile mini-recipes that can be rolled over into five full-fledged suppers. The first rollover recipe is Buttermilk Ranch-Brined Turkey, which Rachael uses in three of the five meals: Turkey and Corn Chowder with Bacon and Chipotle, Pilgrim Casserole layered with Thanksgiving favorites and Turkey and Poblano Red Eye Stew. Then, Rachael dishes up a Beef and Tomato Base, which is the foundation for Beef Picadillo, and Beef, Bacon and Onion Sauce with Bucatini. Premiering Sunday, May 11th at 8am -"5 Nights of Noodles"
Rachael takes advantage of one of the great make-ahead meals, a pasta supper, to provide a week's worth of decidedly different noodle dishes. Weeknight cooking gets simple with Riggies with Roasted Vegetable and Ricotta Sauce, Pepita and Pistachio Sauce with Roasted Squash and Whole Grain Penne, and Beef and Beet Ragu with Pappardelle. Premiering Sunday, May 4th at 10am -"Taco Tuesday"
Inspired by a margarita at one of her favorite bars, Damaris invites the mixologist back to The Kitchen to inspire the perfect Mexican menu to pair with her cocktail. On the menu: easy-to-make spicy, homemade "Fauxrizo" Taco Filling, Coconut Lime Black Beans and a simple, aromatic Jicama and Cilantro Creme Slaw. Damaris's fiery menu is cooled down with a Blackberry and Sage "Heart of Darkness" Margarita. Premiering Sunday, May 11th at 10am -"Ladies Tea Party"
Damaris creates a menu of feminine and elegant dishes with tons of flavor for a lovely afternoon tea with the girls. Instead of the traditional cucumber sandwiches, she mixes it up with delicious Borage Benedictine and Bacon Sandwiches. Then, she takes Southern potato salad to the next level with Beet and Potato Salad with Blue Cheese Dressing and Dill. To finish off a perfect tea party, Damaris serves Saffron Flower Madeleines. Premiering Sunday, May 18th at 10am -"Dinner for Two"
Nothing can spoil a romantic dinner like a stressed cook, so when Damaris' friend Keith needs help planning a special dinner for two, Damaris shows him how to put together a low-stress meal. She starts with a Pan-Grilled Shrimp with Sumac Sauce along with her foolproof Fresh Turmeric Rice and crispy Sauteed Zucchini for a delicious stress-free meal. Premiering Sunday, May 25th at 10am -"Strong is the New Skinny"
When Damaris and her friend Kelly take on the rowing machine at the local gym, they keep their endorphins pumping by making a light, flavorful and satisfying meal. Their menu consists of Quinoa and Salmon Croquettes, Spaghetti Squash with Parsley and Pecan Pesto and Strawberries with Honey Rosemary Whipped Cream for dessert. A crave-worthy, but healthy meal is the perfect reward post-workout. Food Network celebrates Cinco De Mayo with a spicy weekend lineup of recipes featuring new episodes from Farmhouse Rules, Giada at Home, Guy's Big Bite,The Kitchen, Rachael Ray's Week in a Day and Southern at Heart. Premiering Saturday, May 3rd at 10:30am - Farmhouse Rules ­- "Poker Night with Aunt Jean"
Premiering Sunday, May 4th at 8am - Rachael Ray's Week in a Day - "Roll it on Over"
Premiering Sunday, May 4th at 10am - Southern at Heart - "Taco Tuesday"
Premiering Sunday, May 4th at 10:30am - Giada at Home - "Spice of Life"
Premiering Sunday, May 4th at 11:30am - Guy's Big Bite - "Comfort with a Kick"
Whether it is a special breakfast in bed or a brunch with friends, Food Network chefs share their favorite family recipes for Mother's Day featuring new episodes from Farmhouse Rules, Giada at Home, Guy's Big Bite, The Kitchen, The Pioneer Woman, Rachael Ray's Week in A Day and Southern at Heart. Premiering Saturday, May 10th at 10:30am - Farmhouse Rules ­- "Early Birds"
Premiering Sunday, May 11th at 8am - Rachael Ray's Week in a Day - "5 Nights of Noodles"
Premiering Sunday, May 11th at 10am - Southern at Heart - "Ladies Tea Party"
Premiering Sunday, May 11th at 10:30am - Giada at Home - "Lunch with Mom"
Premiering Sunday, May 11th at 11:30am - Guy's Big Bite - "Flowers for Mom"
Food Network celebrates the launch of the summer grilling season with a week of barbeque and grilling episodes including premieres from Chopped, Cutthroat Kitchen, Diners, Drive-Ins and Dives, Guy's Grocery Games, Iron Chef America and Restaurant: Impossible. Premiering Sunday, May 25th at 8pm - Guy's Grocery Games - "Grocery Grillin'"
Premiering Sunday, May 25th at 9pm - Iron Chef America - "Grill Masters: U.S.A. vs. Australia"
Premiering Sunday, May 25th at 10pm - Cutthroat Kitchen - "Well, Hot Clam!" Premiering Tuesday, May 27th at 10pm - Chopped - "Cool, Palm and Perfected"
Premiering Wednesday, May 28th at 10pm - Restaurant Impossible - "Writing on the Wall"
Premiering Friday, May 30th at 10pm - Diners, Drive-Ins and Dives - "Grillin, Chillin & Huli Huli Chicken"
Throw a fiesta this May 5th with margaritas, tacos and authentic recipes from Marcella Valladolid and more. Treat Mom to a delicious breakfast or brunch this Mother's Day with favorite recipes from Giada De Laurentiis and Trisha Yearwood. Plus, get 50 ideas for old-fashioned tea sandwiches perfect for a fancy tea. Celebrate the unofficial start of summer with a Memorial Day feast of burgers, salads and patriotic desserts from Guy Fieri, Bobby Flay and Sunny Anderson. Make any get-together a little sweeter with easy homemade cakes from Ina Garten, Alton Brown and Ree Drummond, plus easy cake-mix confections and cupcakes. FOOD NETWORK (www.foodnetwork.com) is a unique lifestyle network, website and magazine that connects viewers to the power and joy of food. The network strives to be viewers' best friend in food and is committed to leading by teaching, inspiring, empowering and entertaining through its talent and expertise. Food Network is distributed to more than 100 million U.S. households and averages more than 9.9 million unique web users monthly. Since launching in 2009, Food Network Magazine's rate base has grown tenfold and is now the second largest monthly magazine on the newsstand, with over 11.6 million readers. Headquartered in New York, Food Network has a growing international presence with programming in more than 150 countries, including 24-hour networks in the United Kingdom, Asia, and the Europe, Middle East and Africa (EMEA) region. Scripps Networks Interactive (NYSE: SNI), which also owns and operates Cooking Channel (www.cookingchanneltv.com), HGTV (www.hgtv.com), DIY Network (www.diynetwork.com), Travel Channel (www.travelchannel.com) and GREAT AMERICAN COUNTRY (www.gactv.com), is the manager and general partner. You are probably right.That's unfortunate, though. They only way she may leave FN is if Scripps offered her a talk show. Someone has to write the dissenting response. Cutthroat Kitchen is popular and has been renewed for a third and fourth season, so it's not going anywhere. I like the idea of chefs using the sabotages to improvise. Sometimes, when I forget to buy an ingredient, I have to improvise. 1. continuing the Food Network Star BLOG (which will be FAR more informative & engaging than Twitter, although I am grateful for that, too). Symon, Amanda Freitag (good as they are) and/or Top Chef, or Chopped and 150 OTHER people who are NOT competing and have nothing to do with THIS show! It's about season 10 people competing, so let's write about them-- and not whine anymore about guada's cleavage, or pining away after Jeffrey Said (still) and on and on. There should plenty of opinions/feelings/observations/speculations we can share about who's best, worst, how and why they are, who should be sent home next, why, and which 4 deserve to be in the finals and who should win it all and why he or she deserves to. Specific, informative and open opinions are an total blast to write/read/share on the blog. Looking forward to people joining-in with their thoughts. Always a fun thing. Yet another repeat guy was on this weekend was on Chopped. I guess there isn't much money in being a line chef - not that up on the restaurant industry, to be honest. It's much like a lot of minor celebrities that are showing up on reality shows all over - not limited to cooking: Joey Fatone and Florence Henderson were both on Dancing with the Stars. I, too, look forward to the new season. I find these types of shows to be lots of fun. What bothers me the most about Cutthroat is the mean spiritedness of it. Brings out the worst in the chefs - actually encourages it. It's one thing to compete, another to want to destroy. Also, we get our share of would-be strategists on every other cooking competition, so I find it refreshing to just build a whole show around what the slimier competitors are doing anyway. And who doesn't mind being buried on a Sunday morning if he or she wins? Sigh. You're right. That's another thing. Personally, I feel that Damaris is proving herself very well on her Sunday show and would love to see the Food Network let her have a full-time weekday time slot. With her outgoing personality, useful tips/teaching, and variety of flavorful dishes, she deserves at least as much exposure as The Pioneer Woman or Kelsey's Essentials. Since Melissa isn't filming any more new seasons, how about letting Damaris have Melissa's 1:30pm time slot? (They can still show re-runs of Melissa at other times). On another note, I am only now discovering the Bio's of the season 10 FN STAR contenders. But I don't see their audition videos. I hope we get to see those. I almost think those Sunday morning slots are nothing more than a further audition to see if the new "stars" will fly. If they do well, FN promotes them in other venues, such as having Melissa D'Arabian judge on Triple-G and putting Jeff Mauro on The Kitchen. And I could do with a lot less of the Pioneer Woman. Editing and proofreading have never been hallmarks of Food Network. They actually spelled mascarpone marscapone on one of their chyrons, as if it isn't bad enough that almost no so-called professional chefs pronounce it correctly—including Italian-American Guy Fieri. I adore Vic and think he's really too good for FN. I can't STAND to watch anything with Penny on it. She makes me sick to my stomach. The fact that she is making a living being a witch on any show disgusts me. Won't watch that mean-spirited show at all. They have ruined The Next Food Network Star by allowing and encouraging that disgusting behavior on the show, or any show for that matter. I don't enjoy watching low-class nasty behavior. I agree - it's mean-spirited. There is so much anger in this world already, to have a cooking show encouraging people to bring out their worst behavior leaves me cold. There have been some mean-spirited souls on Chopped, but I've also see contestants give ingredients or help to the others. I find that much more refreshing and encouraging. This isn't about improvising, it's about hurting someone else with deliberate actions. Improvising is on Chopped, this is just mean-spirited and often bullying when one chef in particular is singled out. I seen mean spirited things happen on Chopped as well. Not necessarily sabotaging, but people who think they are better than everyone else and don't have anything nice to say about their competitors. Yes, Cutthroat Kitchen can be mean sipirited, but it's still a good competition to watch to see what people can do with what they are given. There are some who were handed sabotages and would go on to win. My message to you is that if you don't the show, turn it off. I don't watch it. I don't care for the new Casino program either. Just commenting that the Food Network is sinking to a new low with some of their shows. It's one thing for some of these chefs to be jerks - it's quite another to encourage the behavior. Sad state of affairs.